Hampstead Synagogue’s history is fascinating and unique. The archives of the shul are currently in the safe hands of the London Metropolitan Archive, being restored to their former glory. This has been done with the intention to preserve as well as display the history of our synagogue. In the first step of showcasing our history, I have been researching the founding of the Hampstead Synagogue and the unusual circumstances of its creation. In doing so, I have come across a more personal connection to the shul’s history through my husband David’s family; the du Parc Brahams, and their long-standing connection to the shul. David’s great-grandfather Charles Abrahams was the first beadle of the shul, from 1892 when it opened, to 1930. His wife Clara du Parc was a gallery attendant in the ladies section. This photo of them from the Jewish Chronicle in 1930 marked the occasion of their retirement. The following is a brief extract to introduce a historical display which will go in the vestibule, intended to showcase the unusual and prestigious history of Hampstead Synagogue. Begun by a small and idealistic band of unconventional Jews, the movement to establish the Hampstead Synagogue became a focus for those who wished to tread the line between United and Reform tradition. These men were defined by their religious restlessness. They set out not only to create a building for the increasing Jewish community in the surrounding area, but within it a movement which would fulfil what century Anglo-Jewry. Increasingly impatient with what they considered the red tape of Judaism, the original founders hoped that the creation of Hampstead would bring about a revival of Jewish influences. The 1880s saw many notable Jewish figures in the field of art and culture living in and around West Hampstead. These men and their open-minded approach to Judaism played an important part in the establishment of the synagogue and the ideology that would support it. They included: the scholar Israel Abrahams; Herbert Bentwich, one of the first followers of Theodore Herzl; Asher I. Myers, editor of the Jewish Chronicle; Rabbi Solomon Schechter, an influential scholar and Zionist; Solomon J. Solomon, an artist married to a suffragette; Lucien Wolf, a popular journalist who wrote under the pseudonym “Diplomaticus”; and Israel Zangwill, a writer nicknamed “Dickens of the Ghetto”, to name only a few. Many of these men were part of a group known as “The Wanderers” who were led by Rabbi Schechter. Their main aim was to make Judaism a “living force”. 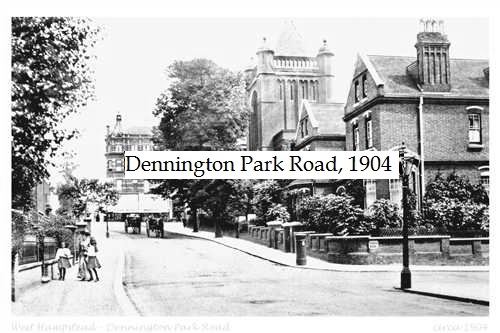 At the time of the shul’s formation in the 1890s, most of the original members lived in Kilburn, St John’s Wood and West Hampstead, although some came from further afield in other districts of North West London. Many Jewish families lived in large numbers in the immediate vicinity of the shul, particularly in the streets off West End Lane. Increased Jewish migration to West Hampstead, paired with considerable agitation seeking a more progressive approach to worship, motivated this group of influential men to set about creating the Hampstead Synagogue. It all began with a letter to the Jewish Chronicle in May 1889 written by Herbert Bentwich, a lawyer who lived in Abbey Road and attended St John’s Wood shul. In his letter he invited support for the “Hampstead Movement” and made clear his intention to establish a new community. Soon a meeting was held in the West Hampstead Town Hall in Broadhurst Gardens and a provisional committee was formed. Their main aim was; “to launch a movement which would be somewhere between Orthodoxy and Reform”. The Chief Rabbi, unsurprisingly, refused to agree to the drastic proposed changes to the Shabbat services. In protest half the committee walked out. Before a brick had been laid, Hampstead Synagogue’s future was in dire jeopardy. The resolutely radical of the committee set up their own services in West Hampstead Town Hall from 1890 and then Kilburn Town Hall until 1893. Meanwhile, the conservative members of the original committee made peace with the Chief Rabbi compromised over their demands and started seeking out a site for the new building. For the next steps in the shul’s creation and beyond, look out for the historical display in the vestibule.